We partner with experts, activists, and other brave advocates for change who confront injustice around the world. Arcus has partnered with more than 400 organizations, ranging in scope from advocacy groups to community centers to sanctuaries. We learn from one another by together taking bold risks on groundbreaking ideas, which drive progress toward a future of respect and dignity for all. 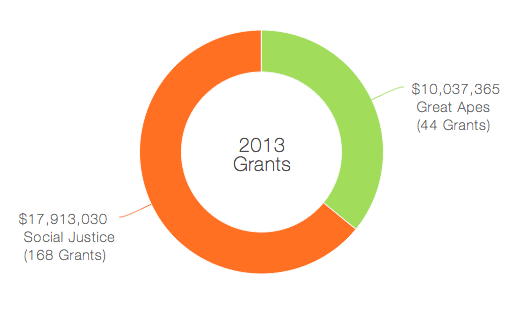 Arcus Foundation grantees work in more than 30 countries around the world, and affect millions of lives. In 2017, more than $10 million was awarded to organizations working to protect the great apes and gibbons, and more than $17 million was awarded to organizations working to advance social justice for LGBT people around the world. “Realistic and…uncanny” was how The New York Times described the animals and tropical foliage in Disney’s 2016 blockbuster The Jungle Book, a remake of the 1960s classic loosely based on the book by Rudyard Kipling. Every one of the 70 species of animal featured in the film was computer-generated using technology, developed during the last two decades, that uses highly sophisticated animation to replicate animals’ images and behavior. Seated in rows for Sunday morning service at the Unity Fellowship church in southeast Atlanta, Georgia, on September 27, 2015, the congregation, expecting to hear a well-known repertoire by a visiting choir, was greeted by the Janelle Monáe-penned protest song “Hell You Talmbout.” The 12-member choir-turned flash mob sang out with call-and-responses, naming some of the scores of black Americans killed by police officers, an unrelenting pattern whose persistence was continually condemned through 2015 and into 2016 by the Black Lives Matter movement. The singing was followed by a litany, written and delivered by trans activist and media maven Raquel Willis. The world’s rarest gorilla, of which fewer than 300 remain in their forest homes along the border between Nigeria and Cameroon, is receiving stronger protection from community groups that have joined together at sites where these great apes live. The Cross River gorilla, a subspecies of the western gorilla, or Gorilla gorilla diehli, classified in 2007 as “critically endangered” by the International Union for Conservation of Nature,1 has been the focus of a 100-person initiative mobilizing nine communities in the Mbe Mountains of Nigeria. When the Lesbian Life Association, based in Côte d’Ivoire’s largest city, Abidjan, was established in the West African country in 2009, its founder went by the name Diane Ouattara and used the feminine pronouns “she” and “her.” Now ADO Jr. (ADO stands for Alexis Diane Ouattara) has steered the advocacy organization to include bisexual and transgender men and women, as well as those who don’t identify with any category under the LGBT spectrum. "Intersex” refers to a variety of body variations, including some chromosomal variations that may not be visible. Between one and two percent of all humans are born with intersex characteristics, ranging from rare to relatively common variations. It was the signature “woop woop” call from deep inside a nature reserve on China’s southern-most island of Hainan in June 2015 that alerted a team of scientists that a tiny population of gibbons, having escaped the imminent threat of extinction, had actually grown.